Hooks for the ironing board are located close to each other in order to occupy a minimum of space. Nevertheless, they are compatible with almost any modern ironing board. 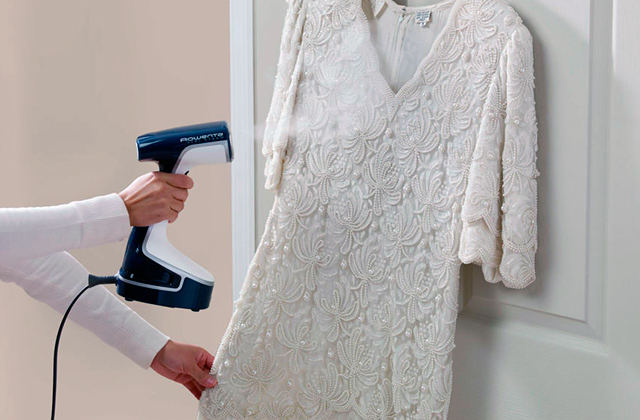 It can be a little problematic to place large irons in the holder. 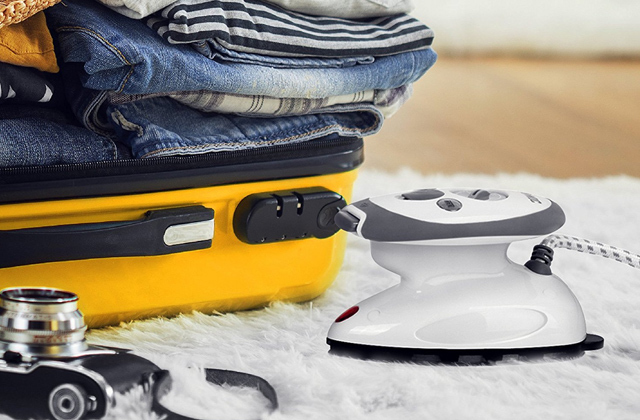 The main part of the holder is made of heat-resistant metal, so you can safely place the iron on it immediately after ironing, even if the sole has not cooled completely. One of the best models that are on sale today. A spacious shelf allows compact storage of various ironing accessories and chemical products like detergents, soaps, stain removers and much more. Suitable only for doors up to 3.5 cm thick. This universal model from MetroDecor will appeal to those people who have not yet chosen a place for its installation: the provided holes for wall mounting and removable door hangers will help to easily change its location. 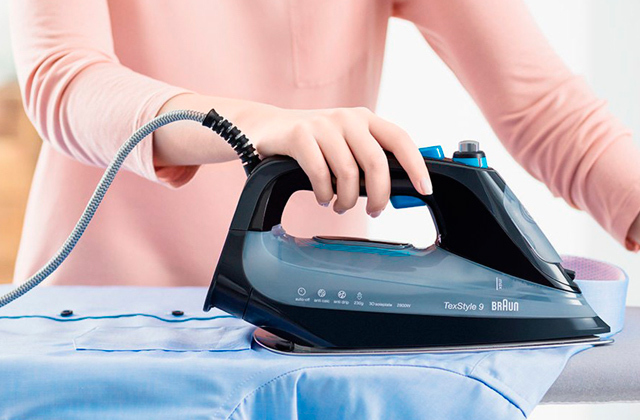 The compartment for iron storage is designed in such a way that you can easily place both small road irons and large steam irons in it, giving this holder a large amount of flexibility. 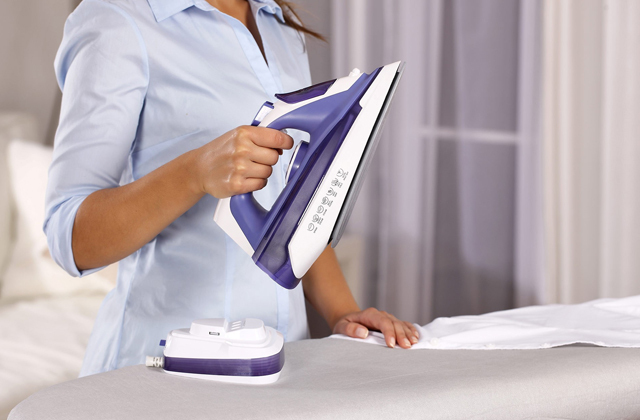 Irons are held upside down, which can lead to water leakage. If you are looking for an inexpensive and practical design for compact placement of your iron and ironing board, then we recommend giving this model a try. It is very well made, and will truly serve you well for many years. The ironing board attaches to the wall by way of the 4 self-tapping screws (already included in the kit) - this ensures reliable fixation and significantly increases the maximum permissible load. Wall screws should be replaced with stronger ones. This model will be indispensable for owners of small dwellings, where each cubic centimeter of space is needed: with its help you can compactly store the iron and board, hiding them from prying eyes. Thanks to the increased width of the fastening loops, this shelf can easily be placed on non-standard sized doors, which have a thickness of up to 4 centimeters. Vinyl coated finish requires more thorough care. The main advantage of this holder from ArtMoon is its simplicity of installation: its fixation absolutely does not require any tools and takes a minimum of time: hang it on any suitable door in the house and it is ready for use. 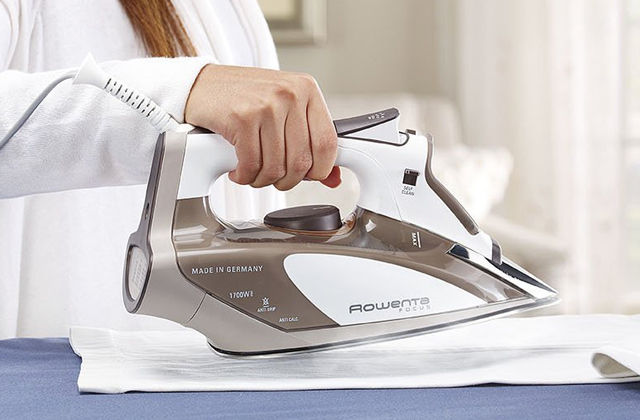 Anyone who has ever owned an iron and find that they need it quickly can tell you about the frustrations of not being able to locate it quickly. 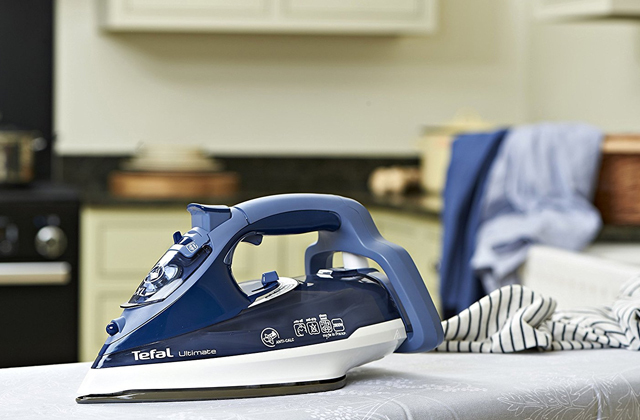 Although irons are not necessarily small items, they do sometimes have a tendency to hide from us at the times where they are needed the most. 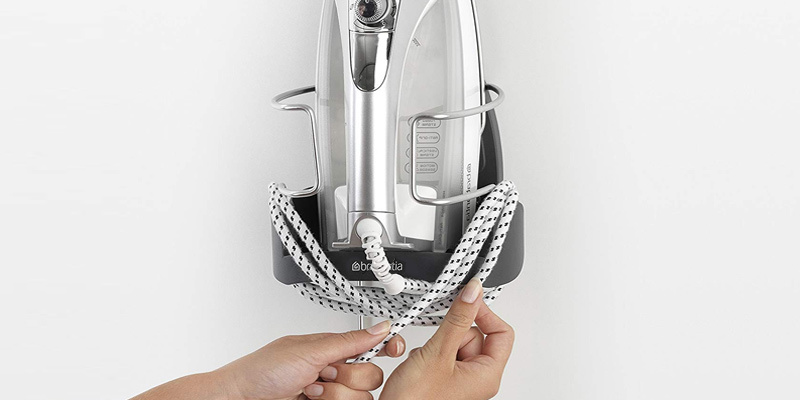 The Brabantia Ironing Board Hanger and Iron Store is a great ironing board holder that can help you keep track of your iron, giving you a place to store it while not in use. 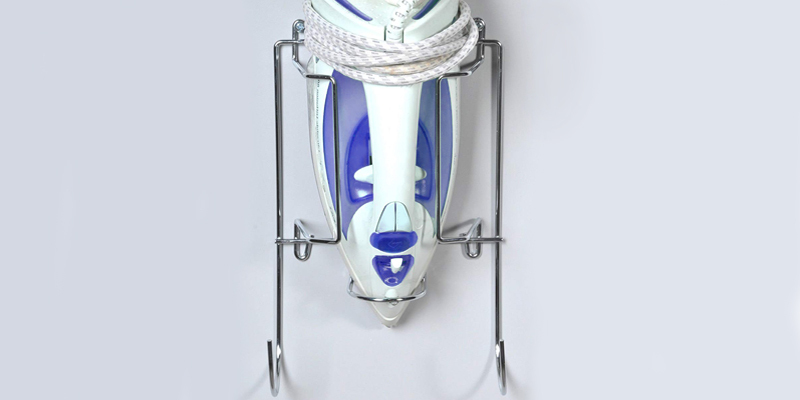 Featuring a strong frame made of steel, this ironing board holder can easily hold your ironing products both while being stored and while in use. 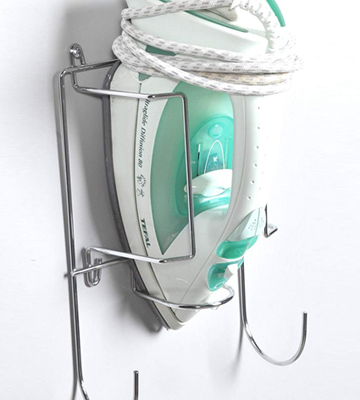 The iron holder is made of heat-resistant metal, making it both safe and easy to store your iron, even shortly after use, so there is no need to worry about a hot iron searing the holder. Installation is also very easy, with the adjustable hooks located close together in order to allow the hanger and its held items to take up a minimum of space. This holder can easily be stowed away behind a closet door, keeping it safely stored and out of the way. 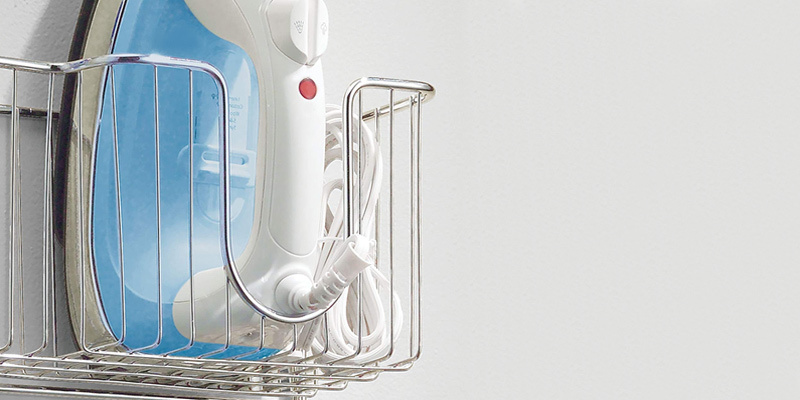 Removing and storing an ironing board held by this holder is also quite easy, and won't be any kind of an ordeal when it's time to do the ironing. 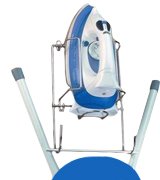 Anyone looking for a great model for their everyday ironing needs will find this holder to be among the best in its class. 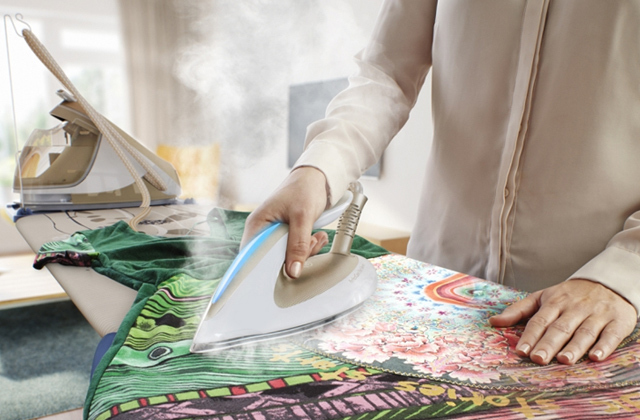 Anyone who is meticulous about keeping their clothes ironed and always looking their best can tell you that ironing will often involve more than just an iron and ironing board. Among the items used are things such as starch, lint brushes, steamers, and other assorted items that many people find necessary. Keeping track of all of these various items can be a pain, but the mDesign MetroDecor Ironing Board Holder with Storage Basket is an ironing board holder that makes it easy to store all of these items in one convenient location. 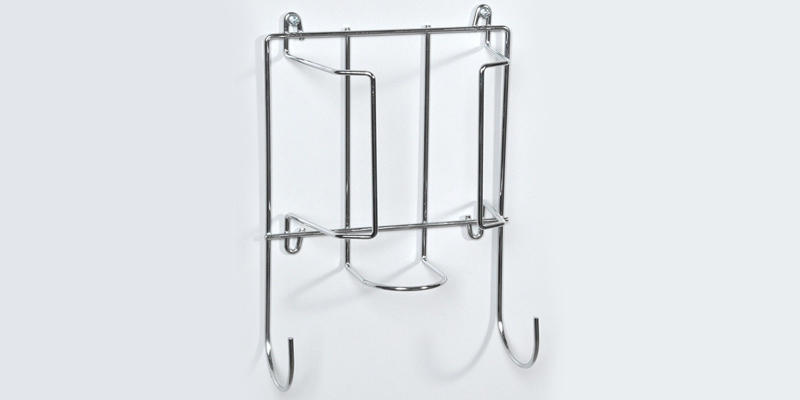 Featuring an easy to hang design, this door mounted ironing board holder includes a large basket meant for storing not just an iron, but many of the assorted items used during ironing as well. 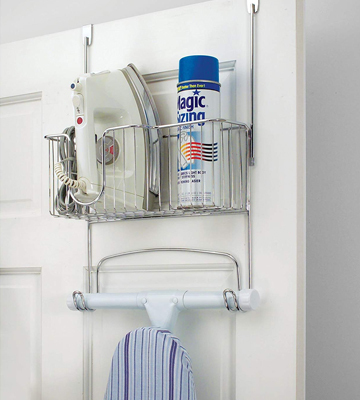 This holder can be mounted either behind a door or on a wall, giving you flexibility with where to store your ironing products. Better yet, the design of it makes it easy to relocate the holder at a moment's notice should you find a better location for storing your ironing tools. Although it makes it easy to keep such tools hidden, the modern design of this ironing board holder is also quite nice, ensuring that it is not an eyesore in any room. Anyone who wants to store all of their ironing products in one easy to access location with find this holder to be a lifesaver. 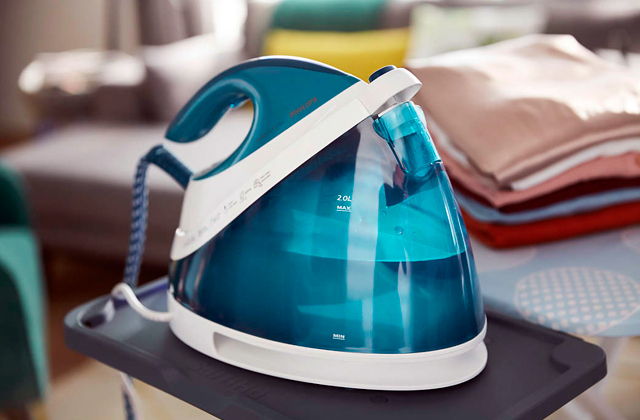 Ironing boards and irons together can be large, bulky items that often get in the way no matter where you store them. The way that they are both often designed makes them easily susceptible to getting in the way and taking up much more space than they should. However, having an ironing board holder such as the Hafele Door or Wall Mounted Holder can allow you to store both in an easy manner while keeping them out of the way. 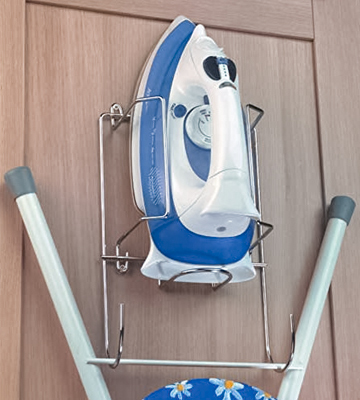 This holder has a sturdy, well-built design that allows you to mount it either on a door or a wall, giving you plenty of options of where to store your ironing equipment. Despite being so sturdy, the design of this product is also such that it allows all equipment to take up an absolute minimum of space, making it perfect for those who find their storage space at a premium. This holder, unfortunately, is not without its flaws. 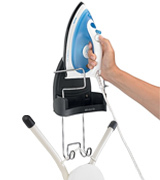 Some users report that not all irons fit well in the holder, which means that those who have an oddly shaped iron may find that it doesn't fit. Also, the design of the holder is such that the iron is held upside down, which can often result in water leakage. 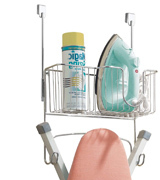 Despite these negatives, anyone who needs to maximise their minimal storage space for their ironing products will be sure to find this holder perfect for the job. Even though there are plenty of ironing board holders available on the market, not all of them are the same. Many of them are cheaply built, and work about as well as one would expect from a cheap item. Some have design problems that make them bad at doing their primary job, and many suffer from quality control issues. Fortunately, there is a model that is an exceptional value while retaining an exceptional design. The Fitmykitchen Hardware Iron and Ironing Board Holder exhibits all of the characteristics that one would want from such a product. Featuring a strong and sturdy build with a steel frame, this ironing board holder gives you a convenient way to store your ironing products while keeping them safe and secure. This holder includes four self-tapping screws that make installing the holder on a wall or door quite simple, while being sturdy enough to hold even the heaviest irons and boards. The heavily polished chrome plated steel helps keep the holder looking great, ensuring that it both looks and performs its primary function quite well, while still being small enough to install in almost any small or crowded location. 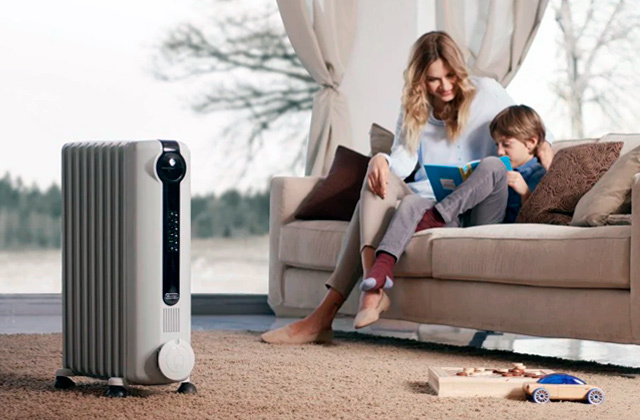 For those who demand a high-quality product, this model is certain to meet their expectations. Bedroom and closet doors can be a great place to store items. As doors are usually either completely open or closed, this means that items stored on them remain out of the way and require a minimum of space. 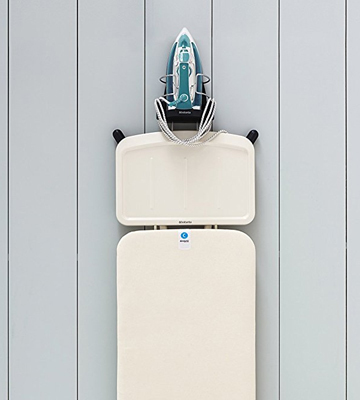 The Artmoon Flint Over Door Iron and Ironing Board Holder gives you a great way to store your ironing products on a door, ensuring that they take up minimal space while still being in a convenient location to access. 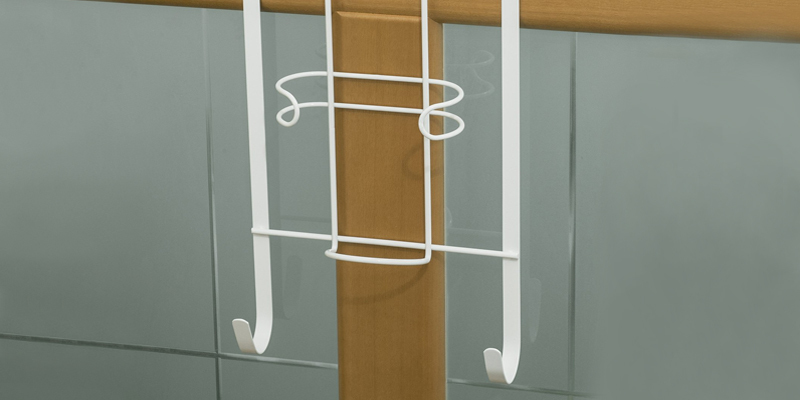 This over the door ironing board hanger can easily fit over the top of almost any door, which means that you don't have to worry about finding the perfect door for storage. 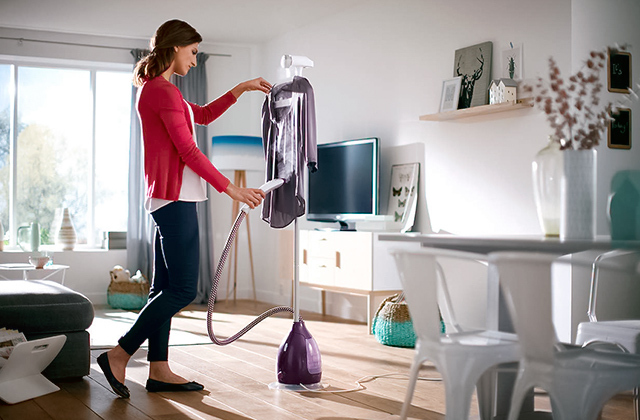 It is also sturdy while remaining lightweight, ensuring that your ironing products won't fall off easily, nor will it cause damage to the door. 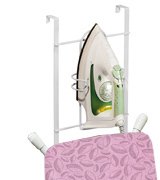 This over the door ironing board holder includes a slim fitted iron holder that holds your iron without requiring a large bulky basket, and also makes the iron easy to place in or remove. The hooks for the ironing board will also hold the board firmly, helping to prevent it from easily falling off. The vinyl coating of the holder may require some care, as it is easily susceptible to scuffs and scratches, but it otherwise looks great while remaining sturdy. 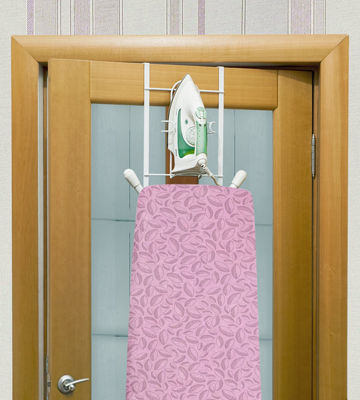 Overall, this ironing board door hanger will prove to be a welcome companion to your ironing products. What Is a Door Ironing Board? 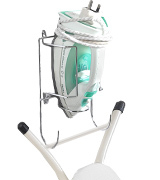 An ironing board is a special table used for conveniently ironing clothes and other fabrics. Today, it is difficult to imagine a family that has no ironing board in their home. Both men and women need this tool to straighten their clothes up and keep their appearance tidy. The problem is, traditional ironing boards are rather bulky and not everyone has enough space to keep one. 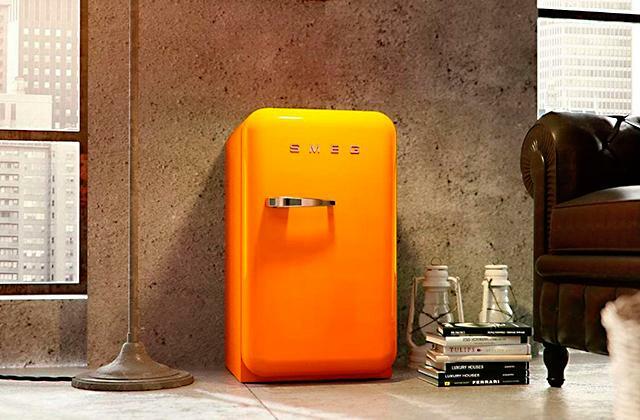 Not only that, some people simply do not want to clutter a room with bulky objects. If you fall into the category of these people, the best solution for you is to consider purchasing an over the door ironing board. This type of ironing board offers a high level of convenience and compactness allowing you to manage your home space wisely and efficiently. Moreover, it is very easy to install. Unlike traditional ironing boards, these ones simply fold down so you don't need to either use tools or exert much effort. With that, hanging ironing boards aren't flimsy and can withstand long time use. Though lightweight, they usually feature a very durable stainless steel frame. In this review, we'd like to present you the best models of door ironing boards out there and let you choose the one that suits you best! We hope sincerely you'll find what you look for in this guide. 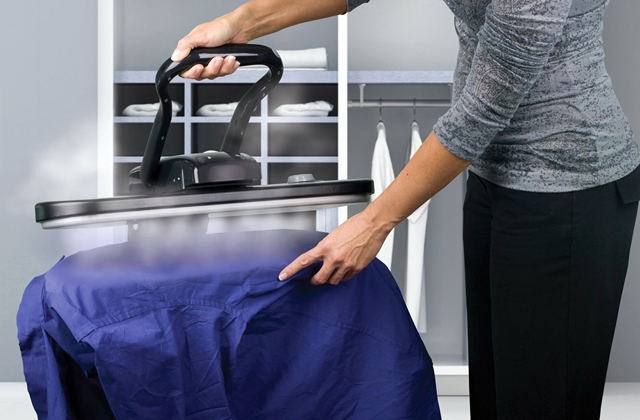 We also suggest you look through our reviews of steam irons and garment steamers that will make your household chores much easier. 1. Mary Marlowe Leverette How to Select the Best Ironing Board and Cover, TheSpruce. 2. Ironing Board Buying Guide, eBay. February 27, 2014. 3. Jackie Reeve The Best Ironing Board, Thewirecutter. April 18, 2017. 4. Mackenzie Wright How to Choose an Ironing Board, SFGate. 5. What To Look For In An Ironing Board, Streetdirectory.